This is the wasp season when populations are at their highest and available food supplies are short. So wasps turn to robbing just about anything and everything! The general public will be targeted by wasps for any morsels of food they drop, hold or are in the middle of eating! My daughter was stung today by a wasp. She is very at ease with bees and wasps, yet it slowly flew up to her and stung her? It had no reason to do so, she had not moved or provoked it. In any case I say this because 98% of stings that people incur are from wasps, NOT honeybees. But people see a flying insect buzzing around and then when stung assume it was a bee (honeybee). Poor bumblebees and honeybees get a bad rap as a result. So why protect a beehive? Well wasps are meat eating predators. They find a bee colony and attack bees one by one, snapping the bee in half with their strong mandibles and fly back to their nest to feed their young. Wasps are sugar junkies. When they feed their larva, the larva in return produces a liquid high in sugar that the wasp will remove and consume. Once one wasp finds your hive they will come back with reinforcements. 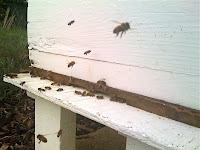 They can kill all your bees, clear out all the honey and move on to the next hive in your apiary until nothing is left. Here are a few tips to reduce wasp attack. 1 Keep your apiary CLEAN. Don’t drop any wax bits, honey, sugar syrup in or around your apiary site. Doing so just shouts out COME AND GET IT!! 2 Reduce the hive entrance. Now is the time to put in your hive entrance block. It is simply a piece of wood the size of the opening to the floor entrance with a 6cm wide cut out opening in the middle. As the entrance and exit point is now reduced it gives your bees a better chance of fending off any wasps that try to sneak into your hive to rob or kill your bees. 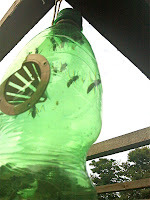 3 Make wasp traps. You can make a simple DIY wasp trap to catch any scout wasps. Scout wasps look for any good food source, communicating to their nest where a site of easy pickings is. Take out the scouts and you can keep your apiary site a secret for a bit longer. 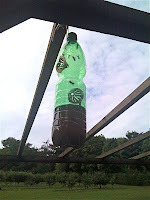 I have a photo of my little DIY water bottle wasp trap. The bait is simply beer and jam. Its nice to know its eco-friendly, safe for plants, animals and the environment. The base of the drinks bottle is filled with the bait leaving about a 6cm gap from the nearest entrance/exit point. I use plastic cones that are made for WBC roof ventilation for the entrance. Make about 3 per hive. I tested these against a major wasp trap manufacturer and I was pleased to see my traps caught 20-30 per day where theirs caught 6-10!